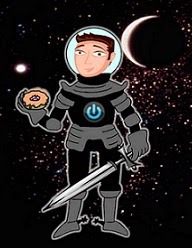 David Powers King: Interview and Giveaway at Read is the New Black, New Release: The Afterlife Academy, and My Con Schedule! Interview and Giveaway at Read is the New Black, New Release: The Afterlife Academy, and My Con Schedule! Hey guys! Before we get started, there's an interview and giveaway for a signed copy of Woven happening over at Read is the New Black. Today is the last day to enter! Head over there for more details. New Release: The Afterlife Academy by Frank L. Cole! Walter Prairie knows how to deal with bullies. He just has to beat them to the punch. But he doesn’t see the biggest hit of his life coming when he is struck dead by a bolt of lightning. Before Walter even knows what’s happened, he is sent to a Categorizing office, fast-tracked through the Afterlife Academy, and assigned as a Guardian Agent to protect a High-Level Target. I look forward to receiving my copy of this soon. Congrats, Frank! Look alive! The Salt Lake Comic Con schedule is up and running. Here's the complete schedule where you can find Michael and/or myself during this awesome three day event next week. If you're planning on going to the con, I sincerely hope to see you there. What else am I up to this week? Probably going to catch a screening of The Scorch Trials and get a head start on winterizing. And writing. 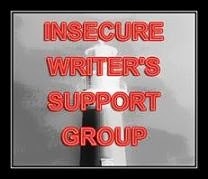 Always more writing. 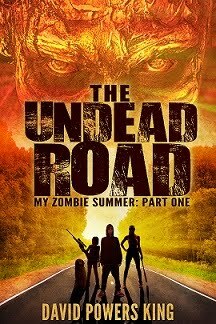 The good news on the zombie novel front is I have a cover designer! Now to keep working and let all the elements settle into place. Thank you for stopping by. Until next time! Check out the interview and giveaway today! Who's up for studying at the Afterlife Academy? What are you doing this weekend? I'm David, and ... "you kids won't last one day out in the Scorch." You'll love the afterlife academy! And have fun at The Scorch Trials… I still haven't seen the first yet! You guys are going to rock the con! Huge congrats to Frank. Have fun this weekend! Glad to get an update on the zombie novel. Live long and prosper David. So checking up After Life Academy on The Book Depository. Hope you have an amazing comicon!! Sounds like a great book. Have fun a the con. This event must be a hoot to attend. Huzzah! I can't wait to see the cover of your zombie book :). Have fun with everything. I hope The Scorch Trials is as good as the last movie. How cool is that! Good luck with everything at ComicCon and with the zombie cover art. Sounds like quite a school! Hope you have a great time this weekend, i'll be recovering from the trip and the work after, i would imagine. That sounds like a great line up and you get to be part of it! Have fun at comic con! So awesome! Do you guys do anything in Utah besides have incredibly amazing Cons? I love the sound of The Afterlife Academy. Have fun at the con. I wish I could be at the comic con. It would be fab to meet you both. Have an awesome time! The Afterlife Academy sounds good! Definitely on my radar now. :) Thanks for sharing! Like the sound of The Afterlife Academy. Different concept. 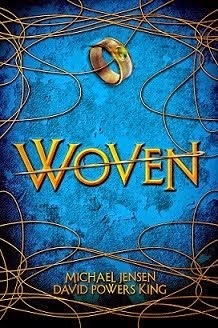 Sorry I missed the giveaway, I would have liked a signed copy of Woven. This is one of those books I want to see in the big screen. Ooh, The Afterlife Academy sounds like a lot of fun. Congrats to Frank! It would be awesome to see you guys at the con wish I could be there. Hope you are both having fun. Like many people, I love cons, and think it would be wonderful to be up there on a panel, sharing experiences and answering questions. Wishing you and Michael all the very best!! did you love the Scorch Trials? I haven't seen it yet, but it's on my "To Do" list. Wish I could make it out to the cons. At least there's the internet, eh? What a premise! 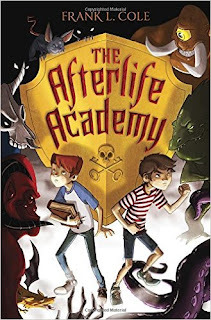 The Afterlife Academy sounds like a great book. Have fun at the con. I want to come to the homicidal author lecture!